Three popular Okinawa gals are tuning up to challenge of a 23-year-old Korean at next week’s Daikin Orchid Ladies Golf Tournament. The 5’3” Shinobu Moromizato, who turned professional only last year, and fellow Okinawans Ayako Uehara and Yayoi Arasaki, are determined to keep Bo Bae Song from repeating her last year’s feat as the Daikin Orchid champion. 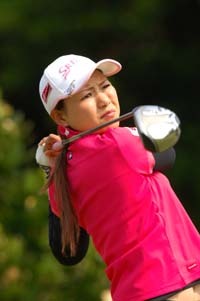 Song, who rolled onto the ladies professional scene in 2004, won last year’s Daikin Orchid event by four strokes. Four new faces will appear on the Ryukyu Country Club course this year, all selected through the Daikin orchid Ladies Amateur Golf Tournament held January 26th and 27th. Making their first visits to Okinawa are Sakurako Mori, Rikako Morita, and Kumiko Kaneda. Others expected to participate in this year’s 54-hole match play event are Miho Koseki, Ri Chihyon, Sakura Yokomine, Akiko Fukushima, Yuri Fudo and Mitei Zen. The 2009 Daikin Orchid Ladies Golf Tournament kicks off Friday, March 6th, at 8:30 a.m. Saturday’s start time is 7:45 a.m., while the championship round on Sunday begins at 8:30 a.m. The three-day event is sponsored by Okinawa Prefecture, Naha and Nanjo Cities, Okinawa Kanko Convention Center and TBS. Ryukyu Broadcasting Company is handling project operations. Ninety professional and amateur players will begin play next Friday. The Friday and Saturday 36-hole totals will determine the 50 players advancing to the March 8th championship round. A total purse of ¥80 million is on the line, with the first place finisher claiming ¥14.4 million. Other prizes include Daikin room air conditioner and dehumidifier, Yanmar fishing boat, a special Orchid pattern tray from Ryukyu Broadcasting Company and Ryukyu Glass special products as the Okinawa Prefecture Governor’s Prize. The tournament will be telecast nationwide on TBS and BS-1 satellite. Advance tickets are ¥1,300 for adults, purchased on day in advance. Friday and Saturday tickets at the gate will be ¥2,000, and Sunday’s championship round tickets will be ¥3,000. All day set tickets covering the three days are ¥3,900, with a ¥1,000 lunch discount ticket included. Juniors and ladies can attend for free. Advance tickets are available at all golf courses and golf equipment shops, Ryubo Department Store, Okinawa Mitsukoshi, Coop Okinawa, Family Mart and Lawson.